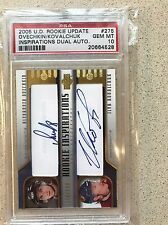 Great opportunity to invest in Ovechkin's rookie card that is sure to increase in value if the Capitals win the Stanley Cup this year. PSA Population of 1. Serial numbered 24/25. Great card of this Great Superstar. KC, MO 64153. 10100 N. Ambassador Dr. Ste. 110. youtube - eliteco3. From the 1981 O-PEE-CHEE hockey collection. This card has a population of JUST 7 with ONLY 3 known examples graded higher! We can be reached at 508-981-4917. Paul Coffey, Jari Kurri, Kevin Lowe, Glenn Anderson and Andy Moog. MY PRICES ARE FIRM. IF YOU DO I MAY PERMANENTLY BLOCK YOUR ACCOUNT. From the 1981 O-PEE-CHEE hockey collection. This card has a population of JUST 21 with ONLY 4 known examples graded higher! The photo depicted is actually B. Ashton. Featured in this set are many of the rookie cards from the Oilers Stanley Cup run including. Autograph Patch 3 Color /99. CHECKOUT OUR FEED BACK, WE HAVE BEEN AROUND SINCE 1993. The cardpictured in the scan is the exact card you will receive. A beautifully conditioned ungraded card with great centering, great overall eye appeal, and an exquisite smudge-free boldautograph. For sale is the pictured 2006-07 Upper Deck Artifacts #191 Sidney Crosby, numbered 08 of only 25 made. It is a population of 1, with none graded higher! Crosby recently won back-to-back Finals MVP awards. 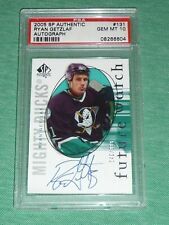 Hockey Card World is not responsible for any duties ot taxes that may be imposed by the respective countries. Our Shop. Shop Categories. < Back Shop Categories. 2016 Mathew Barzal Rookie PSA 9 1/1 Highest Grade #2/5 UD Trilogy Green Tag. Condition is Brand New. Shipped with USPS First Class Package. 2014-15 UD Exclusives SAM REINHART 65/100 PSA10 Young Guns Rookie YG RC Low POP!